Paul Galloway speaks to Tracy Grant Lord about creating theatre in miniature. In theatre, the set model is a key artefact of the design process. At a scale of one to twenty-five and assembled by the designer with card and glue, paints and miniature furniture, it may look like one of those toy theatres loved by Victorian children, but it serves a vital function in the production process. Tracy Grant Lord has designed dozens of major theatre, opera and dance productions in Australia and New Zealand, and for each she has produced a production model. 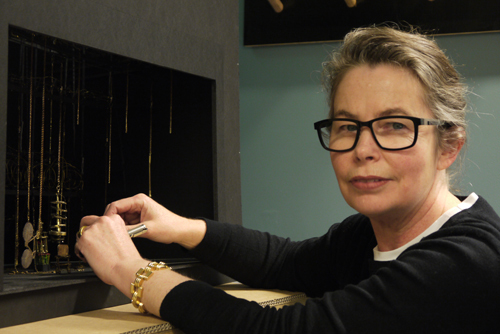 Currently she is designing two major productions for us, Shakespeare’s tragedy “Queen Lear”: and the American screwball comedy “His Girl Friday”:, and though her approaches to these two productions differ greatly, the set model is central to each. Tracy Grant Lord: Personally, I get to the model stage pretty quickly, probably within the first couple of weeks of serious discussion with a director. This is after the initial period of reading, thinking and mulling – post-research and post-familiarisation with the script. We would have talked about the stage world – is it a big world? a small world? open or enclosed? I always have the model box with me in my studio, so once I have a strong idea of what the director wants, I can easily throw together some fast little shapes and things to get an idea of balance and proportion. Paul Galloway: The two plays are very different, Queen Lear is a Shakespearean tragedy and His Girl Friday is a twentieth century farce. I expect that your approach to those works might differ a good deal. Tracy: Absolutely, for example Rachel McDonald [the director of Queen Lear] wanted a ‘fly-in’ show, a bare stage with props coming down to indicate the changes of scene. So I needed to think strongly about these objects within a frame, so the model came into it very early. It was like a piece of sculpture. I began hanging everything from gold chains, which gives a sense of lush, luxury of Lear’s court. From that a model is built at a scale of one to twenty-five, our standard scale in the theatre. Tracy: Tradition, but I suppose it keeps the boxes at a manageable size, transportable, and keeps the little cut outs of the characters you place in the model at a size that can be identified as a person, better for getting a sense of scale. Paul: And for His Girl Friday the process was different? Tracy: His Girl Friday was more about traffic, the movement of the actors on the set. There are a lot of people on stage, moving in and out, and sight lines become quite a challenge. So I needed to establish the positions of doors, the windows, and the furniture before I went onto making a model. So I sketched out a floor plan first so I could lock it down, and gave it to Aidan [Fennessy, the director], so he could see if it would work for him. Discussions go back and forth. So once I established the sightlines and got the traffic moving, then I used the floor plan to work up a model. Paul: And why does a design need a model in the first place? Can’t you just present plans and drawings? Tracy: The point of a model is as a communication tool. Between you and the director, and also the production staff who have to build it. With a model, they receive the entire concept in one view. Which is why the final model must be accurate and must include everything, all the prop pieces, all the furniture, exactly to scale. That old adage, ‘if it’s not on the page it won’t be on the stage,’ is true too of the model. Everything you need on stage must be there, so there won’t be any surprises for the people who have to build it. For me, my model is a tool of intent. And the Lear and Friday models are good examples of the extremes of that. In Lear, there is not a lot of hard scenery, just elements that get flown in. Because it’s a fantasy world, I am creating props that no one has ever seen before. They relate to the scale of actors, actors interact with them, so they need to be detailed in the model. For His Girl Friday, which is set in a press room, the scenic world is hyper-real. It is a manufactured world, a world a little pushed towards the cartoon. We will paint on shadow and texture and depth and light. We will make things look scungy and broken down. And it’s easier to make that clear in the model. Paul: Now there is also a draft model, the so-called ‘white model’, isn’t there? Tracy: Yes, contractually I have to supply a ‘white model’, which normally is prepared six weeks, I think, before the design deadline. And it is an informal way of telling the company of the content. It gives the company a chance to establish whether you have worked within the parameters of the brief – money, materials, build time, all sorts of things that they have to plan for. It’s about general shapes and space, but really more about crunching numbers and man hours. And once there is a go on that, you can move ahead with the final model. Paul: How do the various production departments subsequently use the model? Tracy: The model is converted into drawings, which the workshop work from, because it is just too difficult to work off the model. They need the absolute accuracy that you get from precise plans. The scenic art department probably go back to the model. I give them a lot of other references – I might reference a painting or a particular photograph for one aspect or another. But to get the overview of the stage picture, they will often return to the model. The model is the first reference point, everything begins and returns to the model. Paul: Do you like making the production model? Tracy: Yes I do. I like making models. It’s enjoyable to be with the director, working inside a model box, moving things around. I think about the actors all through the process, where they need to be. It’s a tool. It’s there to serve the playwright, serve the actors and ultimately serve the audience. “Queen Lear”: begins on 7 July at the MTC Theatre, Sumner, while “His Girl Friday”: begins on 11 August at the Arts Centre Melbourne, Playhouse.